The Arakan National Party, the most successful of the ethnic parties in last month’s election, is staking its claim to the post of chief minister in Rakhine State where it expects the NLD to allow it to form the next government. 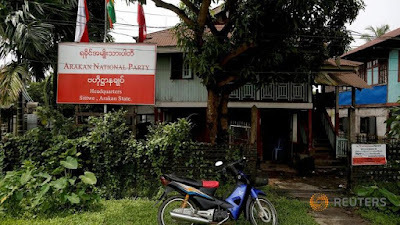 The ANP emerged as the single largest party in the 47-seat Rakhine assembly but fell just short of an overall majority. U Aye Thar Aung, a member of the ANP central executive committee who was among 22 party candidates to win a seat in the Union Parliament in Nay Pyi Taw, noted that the chief minister is appointed by the president who will be nominated by the National League for Democracy. “If the NLD appoints a chief minister from the NLD, then the members of government will also come from the NLD. So we would not be able to form a government … I think that the NLD will negotiate with us [ethnic parties] over this issue,” he told The Myanmar Times yesterday. Despite the success of Daw Aung San Suu Kyi’s party in securing an absolute majority in the Union Parliament, or Pyidaungsu Hluttaw, U Aye Thar Aung said she would still need the support of ethnic parties to carry out her goals. “The NLD needs to cooperate with the ethnic parties to amend the constitution, and for national reconciliation and the peace process. If the NLD wants cooperation with us, they need to give us the opportunity of the post of chief minister,” he said. The prospect of a state government led by the ANP, which strongly defends the Buddhist Rakhine majority, is causing alarm among minority Muslim communities that have been living in segregated camps and villages without access to basic services since communal violence erupted in 2012. NLD spokesperson U Tun Tun Hein said he could not comment on the ANP’s demands. He said the NLD planned to include ethnic parties when it forms governments, as Daw Aung San Suu Kyi has stated, and that the issue would be discussed soon. The NLD says Daw Aung San Suu Kyi is willing to meet the United Nationalities Alliance, a loose grouping of eight ethnic political parties that were established before the 1990 elections. But the UNA, which includes the ANP, has not yet discussed a date for the talks. “I think the meeting between the NLD’s leader and UNA leaders will be held after the election process is over. Also our conference will be held early next year,” said U Myo Kyaw, an alliance member.